In all, Thompson spent a combined 15 hours helping the man, and ultimately encouraging him to seek out treatment. Thompson assisted the veteran to develop a treatment plan and followed up not only with the man, but also with his family. Law enforcement officers make critical decisions every day, some with life and death consequences. One decision, made with compassion, by Delaware County Sheriff’s Deputy Cody Thompson Cody Thompson not only made a difference but saved the life of a veteran in need. Earlier this year, Thompson was sent to conduct a welfare check for a veteran, living in Delaware County, who called the veteran’s crisis line. 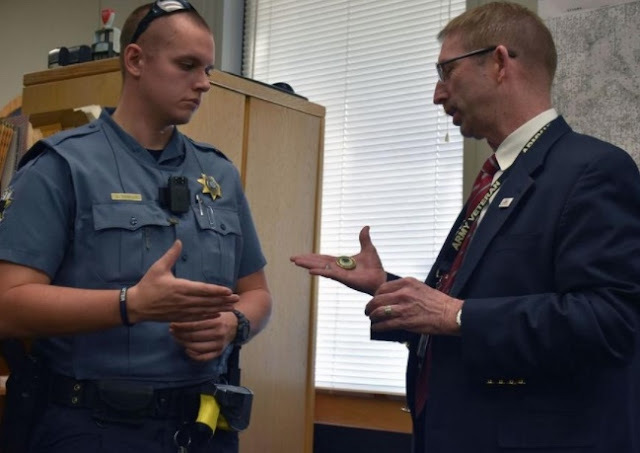 Thompson, who served in the U.S. Army from 2010 to 2016 as a combat engineer and spend time deployed to Afghanistan, took the time to ensure the man was treated properly during their encounter.